As 29 March approaches with no Brexit deal yet agreed on by Parliament, questions are circulating around how leaving without a deal will affect people's daily lives, including the cost of food. At the moment, the UK imports about 30% of its food from the EU and another 10% from the rest of the world. If there's no deal, the question of what will happen to food crossing the border will have to be faced immediately. If Theresa May's plan goes through, there will be a 21-month transition period during which nothing will change while the UK and the EU try to work out a future trade agreement. A tariff is the tax that businesses pay on goods imported from other countries. Different rates of tax apply to different products. But each country has to charge the same rates on the same products to every other country unless they have a trade deal. As a member of the European Union, at the moment the UK doesn't pay tariffs on goods - including food products - coming in from other EU countries. Let's say a supermarket wants to import beef from Ireland. Currently it wouldn't have to pay a tax on this but if after Brexit beef started to be taxed at 40%, which is the tariff the EU places on beef coming in from the rest of the world, that's a 40% extra cost to the importer. The UK Trade Policy Observatory at the University of Sussex calculated that an average tariff of 44.6% on dairy could translate to a price rise of 8.1%. Meat could rise in price by 5.8%, oils and fats by 7.8% and vegetables by 4% on average. Businesses want to charge their customers competitive prices, so they may well absorb some of the costs themselves. But past a certain point, they may well have to pass on that extra cost to make a profit - and that could translate to more expensive food in the shops. The UK could choose to lower tariffs - or scrap them altogether - and that could, in theory, lead to lower prices for consumers. The University of Sussex researchers also assessed the impact of zero tariffs on food imports and said this may only reduce food prices by an average of 1%. That's because the goods which are currently subject to the highest rates of tariffs are food items mainly produced in the UK or imported from Europe without any tariffs, like meat and dairy. And products like tea which the UK mostly imports from outside the EU already attract low tariffs - for tea it's 0.86% - so getting rid of those wouldn't contribute as much to falls in food prices. Businesses could choose to import more products like meat and dairy from outside the EU if that became more competitive. The idea of lowering tariffs on imported goods which the UK also produces has worried farmers, who fear a flood of cheap imported food putting them out of business. In response, the government has said it will not impose zero-rate tariffs on food imports. It will have to balance the interests of consumers, who want to see their food prices kept low, with those of farmers and growers, when setting the tariff rates. Faced with more expensive imported beef for example, shoppers could decide to buy British. But they might not have that choice when it comes to fresh fruit and vegetables. In March, when a lot of the UK's produce is out of season, the country imports 90% of its lettuce, 80% of its tomatoes and 70% of its soft fruit from the European Union, according to the British Retail Consortium, which represents shopkeepers. A no-deal document published by the government said: "At the time of year we will be leaving the EU, the UK is particularly reliant on the short channel crossings for fresh fruit and vegetables. "In the absence of other action from government, some food prices are likely to increase, and there is a risk that consumer behaviour could exacerbate, or create, shortages in this scenario." But it added that less than 1 in 10 food items is expected to be affected. When the value of the pound decreases compared with other currencies, it becomes more expensive to buy things from abroad - a pound that's worth less buys less stuff. That will "directly affect the cost of getting imported food products onto supermarket shelves", the Institute for Fiscal Studies says. It gave the comparison of what happened in 2007-08 around the time of the global financial crisis. 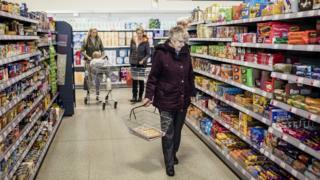 Sterling depreciated in value by 21% and food prices rose by 8.7% relative to other goods. There were other things going on at the time though, apart from currency exchange rates - there were sharp rises in world prices for things like petroleum and fertiliser. But other countries which did not experience currency depreciations did not experience food price rises as "large nor as persistent" as in the UK, the IFS says, suggesting "exchange rates played an important role in driving higher food prices in the UK". The pound has fallen in value since the referendum and that is thought to have contributed to a small rise in food prices, according to a study by the London School of Economics. Another thing which could affect the prices of food for retailers is the cost of having to do extra checks at ports - what's known as "non-tariff barriers". The House of Lords' European Union committee in a report on food prices after Brexit said: "As well as causing delays and shortening the shelf-life of products, non-tariff barriers are an additional cost for businesses". It quoted a report by consultancy firm KPMG which calculated that "one day of delay for a lorry will easily cost a business 600 to 1,000 euros" (£500-£850). The government has set out steps which businesses should take to minimise disruption at borders. In its recent no-deal document it said it was putting procedures in place to make it easier for traders importing from the EU to comply with customs requirements immediately after Brexit, to ease the effects of those non-tariff barriers. It is set to publish a schedule of the tariffs it plans to impose on goods imported from the EU in the event of a no-deal Brexit shortly.